Welcome to our second “Fixing Modern” column, where we define Modern’s most ingrained challenges and offer actionable solutions. Our goal is to give a voice to the many Moderners who have already identified our format’s longstanding difficulties, but currently lack the words or platform to express them. If nothing else, I hope “Fixing Modern” can empower players to discuss these issues in a candid and informed manner. Or maybe it inspires Wizards to launch their own “Fixing Modern” month on the Magic homepage! And then 2016 will see that Damnation reprint too… Even if Aaron Forsythe and his team never so much as see the title, we’ll still discuss “Fixing Modern” on the Nexus. In that spirit of writing, dialogue, and exchanging ideas, today’s article focuses on the critical issue of communication, both from Wizards to the players, and from the community back up to our non-Eldrazi overlords. Last week, I launched “Fixing Modern” with an in-depth analysis of Modern’s mission. Or, rather, its lack of a clear mission. Whether you agree with our ending point or still didn’t buy that Modern had a problem at all, “Fixing Modern: Defining Format Mission” is an important introduction to the methods and style I’ll follow in this column. Hopefully, today’s article prompts the same thoughtful discussion as we saw after our exploration of format mission. After all, communication is just as central to Modern’s health as the solid ground of a functional mission statement, and it’s something Modern has sorely lacked for years. In today’s piece, we’ll map out the scope and consequences of Modern’s communication woes before offering some suggestions for improvements. 1. The exchange of ideas and information between parties through a common system. 2. Something to work on with your spouse, significant other, or partner. 3. A process that breaks down at the very mention of Splinter Twin. Well, mostly just #1. But #2 is important too! As for #3, that’s a specter we’ll try dodging from here until the article’s end. Thinking primarily about #1, this main definition contains a few elements worth highlighting. First, we’re interested in the exchange of ideas and information, not just their one-way delivery. For Modern’s purposes, this means the two-way street from Wizards to players and players right back up. It’s important to establish that up-front before we start blaming Wizards for everything: “exchange” demands multiple parties. Second, we care about not just information but also ideas. Communication can’t just be news bulletins and email blasts. If you’re in a workplace like mine, I’m sure you pay about as much attention to emails that begin “Hi Staff!” as you do to the guy on Reddit who claims Cloudpost deserves its Modern freedom. This process requires both updates and knowledge-sharing (information), but also feedback and proposals (ideas). Finally, we care about a common system of communication, not just an ad hoc patchwork. It must be common in being widely understood and accepted, and systemic in having structure and clear expectations. These are lofty goals for any communication campaign, let alone one surrounding something as massive as Modern. Then again, “Fixing Modern” is a lofty goal period, so it’s fitting to have a lofty goal at the outset. Unfortunately, as we’ll see in the next section, both Wizards and players are well under this bar in some of the most important Modern-related interactions. Now that we’ve united around a shared definition, we can outline where communication has failed in the past. This follows our method from the last article of first, identifying a problem, and second, explaining why it is a problem. To do so, we’ll need to dock all our gripes orbiting the central communication issue (Bans! Unbans! Pro Tours! My Innocent Blood reprint!) and focus on defining the communication gap itself. Because something like the Twin ban is too polarizing, even if it’s intimately connected with our topic, I’m going to draw on a less divisive, but perhaps even more damning, example from Modern’s history to illustrate the communication failures between Wizards and players. Throughout the first half of 2014, Modern was in a great place. Grand Prix Boston-Worcester drew 2,460 players in the last weekend of July, with Grand Prix Richmond shattering tournament records at 4,303 attendees in March. Wizards had banned Deathrite Shaman back on February 3 and simultaneously released Wild Nacatl and Bitterblossom from their unjust confinement. The BGx Midrange menace was tamed, but also remained competitive. Modern never looked healthier, whether from a metagame or attendance perspective. Overall, it felt like Modern was booming and Wizards could do little wrong with the beloved format. Public perception flipped on August 2, 2014, when Helene Bergeot, Director of Organized Play, announced the Pro Tour formats for 2015: Standard and Booster Draft. The Modern Pro Tour, which had existed since 2011, was dead. In the following days, the outcry on social media, the content-sphere, and the collective online community was deafening. Players accused Wizards of everything from deliberately killing the format to trying to sell packs for Standard, and I couldn’t find a single Modern article from the time range that didn’t at least question the decision, if not outright condemn it. A mere eight days later, Wizards reversed course. They edited their original announcement to reflect changing Pro Tour Fate Reforged from Standard to Modern, and published a press release explaining the reversal. The community rejoiced, Wizards breathed a sigh of relief, and the format went on, momentarily distracted by just how formative the moment had been. “The first thing you may notice about this schedule is the format, which is consistent among all Pro Tours next year. Standard is the most commonly sanctioned event by a large margin, and it rewards players who are both good deck builders as well as skilled players. These quotes represented the entirety of Wizards’ official position on the Pro Tour decision at the time of publication. There was no additional context given in the article or in a parallel piece, no intervening explanation between the first and second paragraphs, and no later discussion on the issue at all. No wonder people got mad! For one, Bergeot’s assessment of Standard, which “rewards players who are both good deck builders as well as skilled players,” made it sound like other formats (namely Modern) didn’t accomplish those goals. If not, why mention it for Standard specifically? How else was a jilted Modern community going to read a line like that? Certainly not as a hidden compliment to their rejected format. To be clear, this isn’t an indictment of Bergeot’s writing, competence, or editors. It’s merely highlighting a major problem which went unnoticed: in one blow, Wizards both hacked Modern out of the Pro Tour after three years and delivered a backhanded insult to the removed format. In offering zero explanation about why this decision was made, the update left players to speculate on social media and in forum discussions, not to mention gravitate towards the account of Standard being the only format “reward[ing] players” for deck-building and skill. The second paragraph, the only reference to Modern in the entire article, only made matters worse. These lines read as if Bergeot and her team knew Modern players would be unhappy with this decision, preempting those objections with this olive branch. By all accounts, they genuinely believed it would prevent or placate angry Modern mobs. To me, that’s even more representative of communication issues than if Wizards had said nothing at all. Silence could have been interpreted as an executive decision to stay mute on the issue. This read as nothing more than a public-relations consolation prize. “Sorry we killed your format. At least there’s the Grand Prix!” This is not to say Wizards had some sinister agenda to screw over Modern players and dismiss our concerns. Rather, it’s to emphasize how seemingly small, likely honest communication errors can balloon into major problems. After processing the announcement, the Modern community went nuts, and Wizards staff took to social media to offer some context around the decision and calm the torch-bearing masses. In doing so, they not only failed to soothe the raging hordes, but also exposed the weaknesses in Bergeot’s initial release. They even managed to introduce some of Modern’s most longstanding and contentious ideas, creating problems both for this particular incident and for subsequent Pro Tours and ban updates for years to come. On the one hand, Forsythe’s and LaPille’s messages offered succinct, (presumably) honest, and patently reasonable accounts for distancing the Pro Tour from Modern. I appreciated their candor during this incident, and I know many other players felt the same. Whether or not we agree with their actual arguments, the communication of those arguments appeared quite capable. If nothing else, it was a welcome ray of clarity in a storm of uncertainty. But wait. Hold on a second. The Bergeot article didn’t say a peep about any of these explanations. Especially not LaPille’s bit about bans. How could an article purporting to announce such a major change omit such critical explanations? Wasn’t this decision made because Standard was better for deck-builders and skilled players? Why were Wizards staffers making these significant claims on Twitter when the official article was bleached in public relations speech? In all these questions and the countless others raised in August (and the years since August), we see communications breaking down at the intersection of Bergeot’s article and LaPille’s and Forsythe’s Tweets. On Bergeot’s side, we had an official platform which decreed a decision but included no useful explanation of why that decision was made. On the social media side, we had official Wizards agents explain the decision through an unofficial medium, but also restricted to the 140 character limit of Twitter. It was back-alley public relations at its worst. As someone who does a lot of Tweeting about Modern, it’s hard to think of a more popular medium which also so heavily restricts context. Those limitations are fine when you’re live-Tweeting another UW Eldrazi mirror or re-Tweeting the most flavorful, Vorthosian moment in recent Magic memory (alas, dear Isobel!). They are far from fine when you’re making format-defining characterizations. Bergeot’s article was made for comments like Forsythe’s and LaPille’s. Their inclusion would have helped Wizards both preempt this particular issue and stakeout some clear Modern and Magic policies. Of course, players weren’t blameless either. Many Twitter-minded Moderners probably read Forsythe’s and LaPille’s Tweets with little official follow-up. I was unable to find a single reply where a player dogged Forsythe for clarification, or where someone looped in @HeleneBergeot to ask for official confirmation. No authors published articles about the communication gap, and player outrage immediately died down, despite Forsythe’s and LaPille’s bombshells just sitting there, still ticking. With no “common system” in place, a lot of knowledge and context was ultimately lost around this issue, a failure on both the Wizards and player ends. Eight days later, Pro Tour Modern was back, Wizards had officially acknowledged the incident, and the community had triumphed. Unfortunately, in trying to close the chapter in this eight day window, Wizards made yet another series of communication fumbles. These mistakes only heightened the missteps up until this point, cementing their status as formative Modern issues. It started with the same “2015 Pro Tour and Grand Prix Schedule Revealed” article that sparked the firestorm in the first place. On August 10, someone at Wizards edited the old article, removing all of the quotes I cited earlier. They replaced them with a brief footnote, the only indication of the incident’s passing. To be fair, this ninja-edit probably happened to preserve search engine optimization (making a new article would conflict with the old) and minimize confusion (leaving old references would just contradict new information). This doesn’t make the edits any less of a mistake. Although they surely reduced some level of confusion, they also guaranteed the rationale for reversing the decision was forever separated from the decision itself. You can find the 2015 schedule with a quick Google search. Bergeot’s press release on the decision, however, is a much more elusive document, especially if you don’t even know it exists in the first place. At first glance, this looked like a great start. Bergeot validated player outcry, hinted at an internal process of processing all that feedback, and declared the Pro Tour’s return to Modern. Mission accomplished? Not so fast. This was also the point in the article where Bergeot could have explained why Wizards initially decided to remove Modern from Pro Tour circulation. This could have included Forsythe’s and LaPille’s points, even if not the Tweets themselves. It could have included other factors which had gone under-appreciated. It could even have challenged the Tweet’s assertions, claiming other factors had been at play. Instead, it did none of those things, reinforcing a pattern of opaqueness which marred this entire event. As with the first quote of the release, this appeared to be the perfect redress. Forsythe would be there to talk Modern and R&D, Mark Purvis could join to explain the Pro Tour and its marketing connection, and Bergeot could tie the entire Q&A together. Sounds great to me, even looking back on it almost two years later. There was only one problem: by all accounts, Wizards didn’t save the content of that CoverItLive chat session. In fact, it looks like no one on the entire World Wide Web saved the session. I’ve scoured the Internet looking for any recording of this chat, stopping short of contacting Forsythe, Purvis, or Bergeot directly and asking where it went. If you can find it, paste that baby in the comments and I’ll mail you a signed Clue token from Shadows Over Innistrad. If you have as much luck as I did, and even if some enterprising sleuth did unearth it, we quickly see the problem: such an important chat session about such an important incident should be available for all to see and digest. Or linked back in this press release for future reference. Of course, it hadn’t been clearly communicated at all! The reaction to the Modern Pro Tour’s removal made zero reference to this “random banning” link because Wizards never made that link explicit. As we’ve seen today, Bergeot’s articles and press releases were silent about this “cost of Modern PTs.” Maybe the CoverItLive session cleared it up, but by all accounts, that conversation has been lost to the dustbin of Internet history. If Bergeot had included Forsythe’s and LaPille’s language in either her original “Schedule Reveal” or followup update on August 10, Forsythe’s 2016 Tweet would be totally on-base. Unfortunately, none of those communiques included that information in any official capacity, capping off the August Pro Tour Incident with yet another communication meltdown that would haunt Modern a year-and-a-half later. In last week’s article, we talked about how most Modern problems return to the format’s lack of a clear mission and our inability to answer “What is Modern?” Communication issues are just as central to all those other “Fixing Modern” topics as the format’s lack of commonly-understood purpose. When communication structures and content are as scattered and ineffectual as we saw in 2014, it’s significantly (and needlessly) more difficult for Wizards to disseminate information, collect feedback, and advance our collective understanding of Modern. It’s just as challenging for players to absorb Wizards’ knowledge and share ideas and feedback with the company. The incident showcases all of those communication hurdles and why they posed such serious problems. August 2014 saw some platforms offering too little information and others offering too much. We had Wizards statements that weren’t on the same page both figuratively, in representing different reasons, and literally, in existing across separate mediums. We had a player expectation of one reality (that the Pro Tour’s return is a good thing), a Wizards expectation of another (that it is fraught with problems), and no intersection of those expectations until a crisis like the Twin ban arose. This, on top of all the more minor communication slip-ups like removing content from old articles, failure to save knowledge, lack of follow-through on seemingly major statements, no repetition of important information, and basically everything you would expect from a Dilbertian middle-management dystopia. Has it all been this bad? Not at all! For example, both Modern Masters announcements couldn’t have gone much better. We also know Wizards is more than capable of launching a consistent, engaging, and informative communication campaign around major format shifts like the new Standard rotation, which they introduced early and kept bringing up through this month. Unfortunately, the elements which made those campaigns so successful (not to mention the tight and riveting management of Shadows Over Innistrad spoilers) are largely absent in Modern. This only serves to compound other issues as the format grows, creating both short- and long-term barriers to Modern’s success. In the short-term, it prevents Wizards from accurately answering questions, and blocks players from meaningful interacting with Wizards. In the long-term, it creates an atmosphere of distrust where Wizards can simultaneously believe they are making informed decisions while also being totally out of alignment with public expectations. It is also a climate where players don’t know what to expect from Wizards, and where Wizards doesn’t understand why the playerbase is so ungrateful and unhappy. All of this originates in the broken communication systems highlighted in the August 2014 incident. We’ve seen the communication chaos of August 2014. We’ve also seen how this is problematic both in its own terms, and for the format’s long-term prospects. Now it’s time to offer some solutions to Wizards and the Modern community. It’s important that both parties are involved in these repairs: as discussed in our communication definition earlier, these processes are two-way systems of exchange. Both parties share a responsibility to improve communication. As we’ve talked about in the past, including last week’s “Fixing Modern” column, there’s no reason it should be so difficult to find morsels of information about Modern. Major Modern policy decisions and discussions should exist in one centralized location so Wizards can easily refer back to it and players know where to find this knowledge. A regular Modern Fireside Chat column addresses all of those issues. Published monthly, this would offer Wizards a regular opportunity to discuss some element of Modern, whether organized play, the banlist, reprints, design and development, format health, strategic direction, and many other topics. More importantly, it would act as the central hub for information on all those varied topics. Wizards would be responsible for consistently sticking to the content of those Fireside Chats. Players would be responsible for understanding that content and responding to it. In that sense, the Fireside Chat would both offer an outlet for players to give feedback (for example, via something like Mark Rosewater’s Blogatog, or with just a #ModernFiresideChat in Tweets), and a widely-read platform for Wizards to respond to that feedback. With the Modern Fireside Chat in full swing, players would have a responsibility to ask questions on the #ModernFiresideChat wavelength, not just discontentedly brood on Reddit. Sure, Moderners can (and should!) discuss the official responses through various mediums, but they also need to bring the feedback and ideas to Wizards’ doorstep. If we are too lazy, distrusting, or indifferent to take that small step, Wizards will justifiably have no obligation to respond to that feedback. By a similar token, once Wizards does weigh in on key Modern issues through the Fireside Chat, players need to stay in dialogue with those replies, citing them in posts, referring to them in everyday speech, and pointing newcomers to these official stances. This is how we build institutional knowledge and trust, and if Wizards can meet us halfway with the Fireside Chat, we can join them by using their new column. The Modern Fireside Chat isn’t a panacea for all our communication problems. It will probably even lead to new ones, especially if the column had a different author each week (depending on the topic) and sometimes give conflicting information. This shouldn’t discourage us or Wizards. It’s an expected growing pain in any new communication system, and the Fireside Chat even serves as its own avenue for corrective action. Players can point out the error on social media using the established Fireside Chat blog or hashtag. If an earlier Fireside Chat contradicts a new one, an editor can insert a note (without deleting content!) to clarify Wizards’ position. The next Fireside Chat can even apologize for the conflict. In this way, the Fireside Chat both offers a central platform for Modern communication, while also enabling the mutual exchange of ideas that isn’t currently happening. As with last week’s suggestions, these two proposal invite a number of possible objections. Also as with last week’s suggestions, these objections are chiefly about expectation management, although there is also some question of logistics. Here’s the primary objection to my communication plan, along with my response: feel free to voice any other worries or cautions in the comments. What if “Fireside Chats” create too many expectations or promises? We don’t want another Reserve List! One apparent advantage of not having a Fireside Chat is flexibility. If it’s not in writing, it’s much easier to change course on a major Modern policy decision. Once a promise has been made, it can be very hard to undo: see the decade-old Reserve List nightmare for the perfect example. Won’t a Modern Fireside Chat invite similar problems to Modern? I don’t think so for a moment. For one, the Chat doesn’t need to openly disclose every single element of Wizards’ Modern policy. It can even explicitly acknowledge the need to stay nimble in some realms! Its purpose is just to give definition to the topics that already have definition, and to answer the feedback that can be answered. Second, as I argued last week too, I believe Modern could benefit from a little public accountability and expectation. Wizards clearly has the personnel to craft careful, albeit still informative, public statements. It shouldn’t be too hard to answer questions and improve community understanding while also avoiding trapping the company in some new Reserve List pledge. Given how much interest Modern content generates on other websites, I’m confident a monthly Modern Fireside Chat column would attract a sizable readership and promote substantial discussion throughout the Magic community. It would also drive new players to the format, offering a monthly platform for Wizards to educate the community about Modern, bolster format confidence, and increase player excitement. I’d certainly point every single Modern player to every single column, and I know most of our thousands of readers would do the same. Modern mission? Done. Modern communication? Solved. In the words of a great animated character, “[We] can fix it!” Hopefully. Maybe. It’s not quite as easy as Fix-It Felix, Jr. would have us believe, but it can be done and both Wizards and the Modern community have the tools to do it. I’m excited to keep proposing ideas and do what I can to improve our great format, which is why I want to give a preview of the next two “Fixing Modern” columns as a roadmap of where we go from here. By next Wednesday, we’ll know the full Shadows Over Innistrad set, and it will be time to talk about a critical piece of “Fixing Modern,” one intimately connected to new set releases: testing reprints and new cards for our format. A week later on April 6, we’ll be two days off the Eldrazi banlist update, which is the perfect time for “Fixing Modern” to address ban mania, banlist management, unban policy, and all things banlist-related. Buckle up and sharpen those axes because it’s going to be a wild ride. That’s all for today! Thanks for reading and for sharing the “Fixing Modern” passion with me, and I look forward to discussing all of these issues in the comments. 1. Format management–similarly to most of your suggestions, I think having actionable statements about the format covered in one place (even if they get made elsewhere and just repeated in the monthly chat) is a valuable tool, both for marketing the format, improving player confidence in WOTC, and health of the format itself. 2. 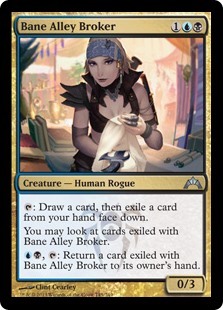 I would love to hear what WOTC has to say about the format–sure, we see their breakdowns, and we have the banlist announcements, but it would be nice to have an indicator for what conditions make a card even come up for banlist discussion–it’s fairly obvious that something like goryo’s vengeance deserves at least a quick look every ban cycle, even if just to verbally confirm with all those in the discussion that nothing significant has changed with its status. It’s not obvious whether cards like ensnaring bridge, blood moon, lantern of insight, or lightning bolt come under discussion–these cards are perennially on polls about changes to the modern banlist, though they rarely get particularly high vote ratios, but it would be interesting to know what conditions even get a card on the table for (token/procedural) discussion—clearly, there are cards that are in pretty much no danger of getting banned that certainly need to be under discussion by the ban committee, if only to establish parameters for the format (e.g. lightning bolt). Agree with everything you said. Although Wizards still wants to keep agile and not set expectations too high (or make promises they later need to break). That said, the potential benefits of a Fireside Chat far outweigh the potential costs, and I really hope Wizards sees it the same way and starts opening up communication channels on this format. This article is great, and highlights/addresses many of the concerns modern players have these days. However, wizards(read: Hasbro) is probably too cheap to allocate additional resources to address a format that doesn’t “bring in revenue”, unlike standard. It will continue on like this until wizards find a way to monetize modern like standard, probably by creating a new format or supplementary product that funnels directly into modern without going through standard. I think all readers should copy paste these articles and tweet them straight at Forsythe & co.
I’m amazed at the high quality of your writing and perspective. Through your articles you’ve shown a deep understanding for both the format and what the community wants. For that to go unnoticed by the people in charge would be a great loss to both the community and WoTC. We should all thank you for doing all this work on our behalf. So, thank you. This article really hits the nail on the head. WotC has abysmal communication. I don’t know if it is due to internal disagreements, purposeful misdirection (unlikely), or simply the difficulty inherent in communicating with a player base that has different levels of engagements and understanding. I think it’s a bit of all actually. Are they going to keep the Modern PT? Are they going to ban a big card every January for purposes of “shaking up” the PT? Are they going to push the power level on cards of the set that is meant to be marketed by a modern PT? Are they going to change their reprint schedule to make the format more accessible? Where does Modern fit into WotC’s business model? What are they going to do about the fact that as the card pool expands, linear strategies keep getting better and better? The next year is going to be a big one for our format. WotC could start moving to slowly retire it (Vintage and Legacy style, a slow death) or they will double-down and recommit to supporting it via a clear reprint schedule, a PT policy, and clear format definition. My guess is that they will continue with their awful ambiguity, which will continue to punish us as consumers. But I can hope otherwise. Regarding the chat that never materialized i actually mailed Helene the day before it was supposed to be asking for a link and if it still was on. She did reply in the lines of “since we made the call to reinstate modern as a PT-format and various people here at Wizards been vocal on our reasons for this on twitter we feel that this chat is no longer needed”. I tried to find the actual mail but didnt but those were her sentiment on the matter to the best of my memory. Modern is where Standard goes to die, so it is Hell. We end up throwing our decks at each other to win as fast as possible. Some people think they are more clever than others and try to play controlling decks etc. They invariably ends up getting smoked by turn 4 anyway. Modern is a fun format and should be kept as that. If I had any skill in the game I would avoid Modern as the die-roll favors the idiot. Being an idiot, I like Modern quite a bit, as it gives me the odd opportunity to wreck my opponents without much thought going into it. Based on this, I understand why many pros (PV, Turtenwald etc.) don`t like Modern for their top tier tournaments. Any effort to smart up Modern is futile. Bogles Vs. 8-whack!?! ?